It’s always good to serve your website visitors with recent posts on the home page in the sidebar. In fact, displaying latest post on sidebar is one of the most user-friendly ways of navigation through which one can easily land to specific blog post without roaming around unnecessary. However, most of the WordPress themes/ templates used to come with automatic latest post display option by default. But, what if one want to display recent posts from specific category only. In today’s post of CSSChopper, we would like to discuss how you can show Recent Posts in the sidebar from a specific category without a Plug-in in WordPress CMS. By using WordPress hack, you can easily display your latest posts from a specific (single) category. 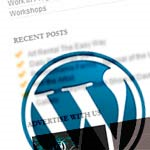 Before that, we will tell you different ways to display the recent posts in WordPress. Simply paste the following codes to display latest posts with summary including title and a short description. By copying and pasting following codes you can display recent posts with full content (in WordPress only). To show recent post from a specific category simply copy and paste the following codes. By this, you can easily recent posts in the sidebar from a specific category without a Plug-in in WordPress. In the above mentioned code, cat=26 symbolizes category ID number and showposts=10 stands for recent posts from specific category count. Don’t forget to check specific category ID from admin panel, manage, categories while adding the above codes to sidebar.php file.